Why Is There No Massive Antiwar Movement in America? Sometimes, serving your country means standing up against it. There was the old American lefty paper, The Guardian, and The Village Voice, which beat the sixties into the world, and its later imitators like the Boston Phoenix. There was Liberation News Service, the Rat in New York, the Great Speckled Bird in Atlanta, the Old Mole in Boston, the distinctly psychedelic Chicago Seed, Leviathan, Viet-Report, and the LA Free Press, as well as that Texas paper whose name I long ago forgot that was partial to armadillo cartoons. And they existed, in the 1960s and early 1970s, amid a jostling crowd of hundreds of “underground” newspapers—all quite aboveground but the word sounded so romantic in that political moment. There were GI antiwar papers by the score and high school rags by the hundreds in an “alternate” universe of opposition that somehow made the rounds by mail or got passed on hand-to-hand in a now almost unimaginable world of interpersonal social networking that preceded the Internet by decades. And then, of course, there was I.F. Stone’s Weekly (1953–71): one dedicated journalist, nineteen years, every word his own (except, of course, for the endless foolishness he mined from the reams of official documentation produced in Washington, Vietnam, and elsewhere). I can remember the arrival of that newsletter, though I no longer know whether I subscribed myself or simply shared someone else’s copy. In a time when being young was supposed to be glorious, Stone was old—my parents’ age—but still we waited on his words. It helped to have someone from a previous generation confirm in nuts and bolts ways that the issue that swept so many of us away, the Vietnam War, was indeed an American atrocity. They say you can’t go home again, but recently, almost 44 years after I saw my last issue of the Weekly—Stone was 64 when he closed up shop; I was 27—I found the full archive of them, all nineteen years, online, and began reading him all over again. It brought back a dizzying time in which we felt “liberated” from so much that we had been brought up to believe and—though we wouldn’t have understood it that way then—angered and forlorn by the loss as well. That included the John Wayne version of America in which, at the end of any war film, as the Marine Corps Hymn welled up, American troops advanced to a justified victory that would make the world a better place. It also included a far kinder-hearted but allied vision of a country, a government, that was truly ours, and to which we owed—and one dreamed of offering—some form of service. That was deeply engrained in us, which was why when, in his inaugural address, President John F. Kennedy so famously called on us to serve, the response was so powerful. (“And so, my fellow Americans, ask not what your country can do for you; ask what you can do for your country.”) Soon after, my future wife went into the Peace Corps like tens of thousands of other young Americans, while I dreamed, as I had from childhood, of becoming a diplomat in order to represent our country abroad. And that sense of service to country ran so deep that when the first oppositional movements of the era arose, particularly the Civil Rights Movement, the impulse to serve was essential to them, as it clearly was to I.F. Stone. The discovery that under your country’s shining veneer lay a series of nightmares might have changed how that sense of obligation was applied, but it didn’t change the impulse. Not at all. In his writing, Stone was calm, civil, thoughtful, fact-based, and still presented an American world that looked shockingly unlike the one you could read about in what wasn’t yet called “the mainstream media” or could see on the nightly network news. (Your TV still had only 13 channels, without a zapper in sight.) A researcher par excellence, Stone, like the rest of us, lacked the ability to see into the future, which meant that some of his fears (“World War III”) as well as his dreams never came true. But on the American present of that time, he was remarkably on target. Rereading some of his work so many decades later set me thinking about the similarities and differences between that moment of eternal war in Indochina and the present endless war on terror. Among the eeriest things about reading Stone’s Vietnam, Laos, and Cambodia coverage, 14 years into the next century, is how resonantly familiar so much of what he wrote still seems, how twenty-first-century it all is. It turns out that the national security state hasn’t just been repeating things they’ve done unsuccessfully for the last 13 years, but for the last 60. Let me offer just a few examples from his newsletter. I think you’ll get the idea. And so it goes reading Stone today. But if much in the American way of war remains dismally familiar some five decades later, one thing of major significance has changed, something you can see regularly in I.F. Stone’s Weekly but not in our present world. Thirteen years after our set of disastrous wars started, where is the massive antiwar movement, including an army in near revolt and a Congress with significant critics in significant positions? Think of it this way: in 1968, the head of the Senate Foreign Relations Committee was J. William Fulbright, a man who came to oppose U.S. policy in Vietnam and wrote a book about this country titled The Arrogance of Power (a phrase no senator who hoped to stay in Washington in 2015 would apply to the U.S.). The head of the Senate Armed Services Committee today: John McCain. ‘Nuff said. In the last six decades, the American national security state has succeeded strikingly at only one thing (other than turning itself into a growth industry): it freed itself of us and of Congress. In the years following the Vietnam War, the American people were effectively demobilized, shorn of that sense of service to country, while war was privatized and the citizen soldier replaced by an “all-volunteer” force and a host of paid contractors working for warrior corporations. Post-9/11, the citizenry was urged to pay as much attention as possible to “our troops,” or “warriors,” and next to none to the wars they were fighting. Today, the official role of a national security state, bigger and more powerful than in the Vietnam era, is to make Americans “safe” from terror. In a world of war-making that has disappeared into the shadows and a Washington in which just about all information is now classified and shrouded in secrecy, the only way to be “safe” and “secure” as a citizen is, by definition, to be ignorant, to know as little as possible about what “our” government is doing in our name. This helps explain why, in the Obama years, the only crime in official Washington is leaking or whistleblowing; that is, letting the public in on something that we, the people, aren’t supposed to know about the workings of “our” government. In 1973, President Richard Nixon ended the draft, a move meant to bring a rebellious citizen’s army under control. Since then, in a host of ways, our leaders have managed to sideline the citizenry, replacing the urge to serve with a sense of cynicism about government (which has morphed into many things, including, on the right, the Tea Party movement). As a result, those leaders have been freed from us and from just about all congressional oversight and so have been able to do what they damn well pleased. In practice, this has meant doing the same dumb, brutal, militarized things over and over again. From the repetitive stupidity of twenty-first-century American foreign—that is, war—policy, you might draw the conclusion (though they won’t) that the citizenry, even in revolt, has something crucial to teach the state. Nonetheless, this demobilization of us should be seen for what it is: a remarkable achievement. It means that you have to be of a certain age (call me “I.F. Pebble”) even to remember what that urge to serve felt like, especially once it went into opposition on a massive scale. I.F. Stone was an early model for just that. In those years, I was, too, and there was nothing special about me. Untold numbers of Americans like me, military and civilian, engaged in such acts and thought of them as service to country. Though they obviously didn’t fit the normal definition of American “patriotism,” they came from the same place. 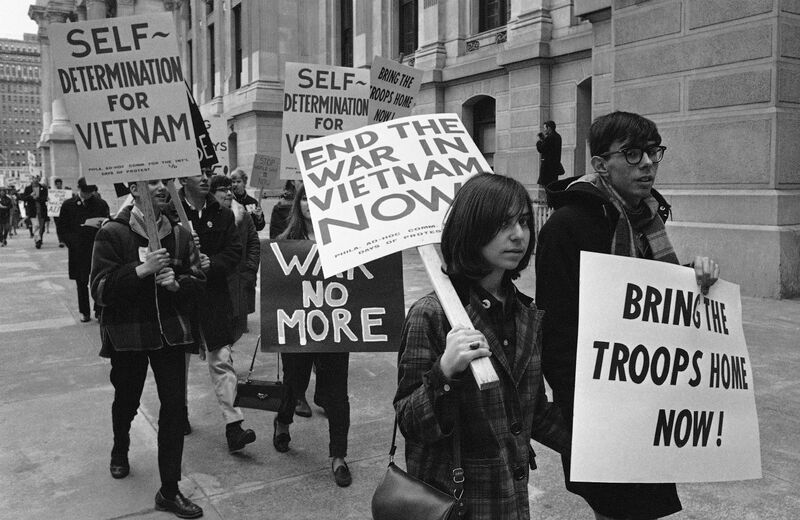 In April 1968, not so many months after the Tet Offensive, I went with two close friends to a rally on Boston Common organized by an anti-draft group called the Resistance. There, the three of us turned in our draft cards. I went in jacket and tie because I wanted to make the point that we weren’t hippy radicals. We were serious Americans turning our backs on a war from hell being pursued by a country transforming itself before our eyes into our worst nightmare. Even all these years later, I can still remember the remarkable sense of exhilaration, even freedom, involved and also the fear. (In those years, being a relatively meek and law-abiding guy, I often found myself beyond my comfort zone, and so a little—or more than a little—scared.) Similarly, the next year, a gutsy young woman who was a co-worker and I—I had, by then, dropped out of graduate school and was working at an “underground” movement print shop—drove two unnerved and unnerving Green Beret deserters to Canada. Admittedly, when they began pretend-machine-gunning the countryside we were passing through, I was unsettled, and when they pulled out dope (no drugs had been the agreed-upon rule on a trip in which we were to cross the Canadian border), I was ready to be anywhere else but in that car. Still, whatever my anxieties, I had no doubt about why I was doing what I was doing, or about the importance of helping American soldiers who no longer wanted to take part in a terrible war. Finally, in 1971, an Air Force medic named Bob Boardman, angered by the stream of American war wounded coming home, snuck me into his medical unit at Travis Air Force Base in northern California. There, though without any experience as a reporter, I “interviewed” a bunch of wigged-out, angry guys with stumps for arms or legs, who were “antiwar” in all sorts of complex, unexpected, and outraged ways. It couldn’t have been grimmer or more searing or more moving, and I went home, wrote up a three-part series on what I had seen and heard, and sold it to Pacific News Service, a small antiwar outfit in San Francisco (where I would subsequently go to work). None of this would have been most Americans’ idea of service, even then. But it was mine. I felt that my government had betrayed me, and that it was my duty as a citizen to do whatever I could to change its ways (as, in fact, I still do). And so, in some upside-down, inside-out way, I maintained a connection to and a perverse faith in that government, or our ability to force change on it, as the Civil Rights Movement had done. That, I suspect, is what’s gone missing in much of our American world and just bringing back the draft, often suggested as one answer to our war-making problems, would be no ultimate solution. It would undoubtedly change the make-up of the U.S. military somewhat. However, what’s missing in action isn’t the draft, but a faith in the idea of service to country, the essence of what once would have been defined as patriotism. At an even more basic level, what may be gone is the very idea of the active citizen, not to speak of the democracy that went with such a conception of citizenship, as opposed to our present bizarro world of multi-billion-dollar 1% elections. At least, it’s over this way, it could have been worse. Stone’s sign-off, that medic’s song, and my letter all are documents from a time when Americans could be in opposition to, while also feeling in service to, their country. In other words, they are documents from a lost world and so would, I suspect, have little meaning to the young of the present moment. Can there be any question that today’s young are a volunteering crew, often gripped by the urge to help, to make this world of ours a better place? Can you doubt as well that they are quite capable of rising to resist what’s increasingly grim in that terrible world, as the Occupy moment showed in 2011? Nor, I suspect, is the desire for a government that they could serve gone utterly, as indicated by the movement that formed around Barack Obama in his race for the presidency (and that he and his team essentially demobilized on entering the Oval Office). What’s missing is any sense of connection to the government, any sense that it’s “ours” or that we the people matter. In its place—and you can thank successive administrations for this—is the deepest sort of pessimism and cynicism about a national security state and war-making machine beyond our control. And why protest what you can’t change?